I'll never forget the day I heard the news that Robin Williams had died. A child of the 1990's, I was first introduced to his work in Disney's Aladdin. The VHS of that movie played on a loop for several years at my house. As I grew older, I discovered William's other classics like Mrs. Doubtfire, Good Morning Vietnam, and Dead Poet's Society. There was something about the magnetism and unabashed humanity in William's performances that you couldn't look away from. Hearing the tragic news that he had ended his own life seemed incomprehensible. This man who was such a blazing force within American popular culture was suddenly gone. When the publisher offered me a copy of New York Times reporter Dave Itzkoff's biography of Robin Williams, I jumped on the chance to read more about his fascinating life. Like most biographies, Itzkoff begins Robin William's story at the beginning. A young Robin lived in a household of financial and cultural privilege, but also one of isolation. His family moved around a lot, and as an only child, Robin spent hours alone. He collected miniature soldiers. Young Robin would spend his days reenacting famous battles and providing the various voices to his characters. During these formative years, he discovered the relationship between comedy and emotional connection. The foundation of his relationship with his parents was making them laugh. Into adulthood, Robin had difficulty following the path of his father's expectations. A corporate job just wasn't going to work for Robin. He found solace in the theater department of his college and soon began to dabble in improvisation. In improv, Robin could let loose and allow his vast imagination to take control. When he burst onto the Los Angeles standup comedy scene, everyone took notice. Other comics related his style to turning on a faucet. When Robin got on stage, the faucet turned on, and a stream of invention flowed out. His time at the comedy clubs turned into a guest appearance on Happy Days. When ABC was looking for a new sitcom, executives created the spin off Mork and Mindy, and a star was born. 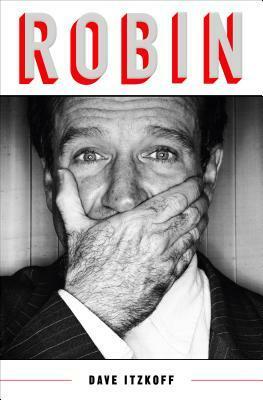 Throughout Robin, Dave Itzkoff provides an intimate and illuminating portrait of Robin Williams. He interviewed countless people who were involved with Williams both personally and professionally, giving this book a full scale look at the man through their eyes. We read about Robin's elation at fatherhood, marriage, and winning the Academy Award. Equally featured are the darker times of addiction, divorce, and costly career missteps. The last section of the book deal with the months leading up to Robin's death. The reporting on this tragic end is the most complete and thorough telling that I've read. Itzkoff peels back the layers of Robin's public persona and reveals the raw and intricate details that made this fascinating man function. Whether you are a fan of Robin William's work, interested in addiction or mental health, or are just looking for a good read, Robin by Dave Itzkoff is certainly a biography worth spending some time with. For more information, visit Amazon and Goodreads. This entry was posted on Saturday, May 26, 2018 and is filed under Biography,Book Review,Comedy,Dave Itzkoff,Nonfiction,Robin,Robin Williams. You can follow any responses to this entry through the RSS 2.0. You can leave a response. The end was very hard to read, but the author treated his entire life with genuine respect. I think my intro to Williams work was when he was Mork on Happy Days in the late 70s. I am glad this biography does him justice. Very cool that you got to enjoy him from the start!